One of the first true little man basketball players. Attles was only 6 feet tall but quickly became one of the leading sixth men in the NBA. After three years of starring at North Carolina A&T Attles entered the NBA draft where he was drafted in the 5th round by the Philadelphia Warriors. Attles served as the primary backup to point guard Guy Rodgers, joining the Warriors also paired him with Wilt Chamberlain, Tom Gola and Paul Arizin. In his second year Attles became more of a contributor to the Sixers and helped them reach the Eastern finals, but like they did in most of the 1960s the Warriors fell short against the Boston Celtics. Following his second year the Warriors relocated to San Francisco. The move was a difficult one for all involved as the team went from being an eastern elite to not making the playoffs in the west. But the following season the Warriors finally made the NBA finals where they once again lost to the Boston Celtics. Attles continued to be a key player on the Warriors when they made their second trip to the NBA finals in 1967 where they lost to the Wilt Chamberlain lead Philadelphia 76ers. By 1968 Attles began to drop off some and was no longer the best bench player the team had, however, he was still effective and a key member of the team. 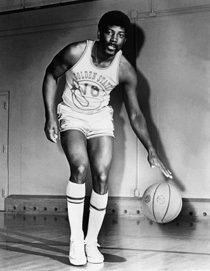 Attles became a player-coach for the Warriors in 1969. He played sparingly during this time, and in 1971 after 10 years in the NBA Al Attles retired having played his entire career with the Warriors. He decided to focus only on coaching and helped turn the Warriors back into a title contender. When he took over coaching he became one of the first black coaches in NBA history. When he lead the Warriors to the 1975 NBA title he became only the second black coach to ever win an NBA title; Bill Russell was the first. The last six years of Attles coaching career were terrible, he did not make the playoffs in any of them and at one point during the 79-80 season was fired only to be rehired. He finally quit coaching for good following the 1983 season.